Just like with all other sports out there, golf demands a special kind of footwear. If you don’t wear the right type of shoes, injuries are bound to happen. Actually, according to statistics, some of the injuries related to golf are as a result of poor choice of shoes. When it comes to golf shoes, the range of options available for female golfers is as great as it’s ever been. Today, there are different styles from those that look like work flats to those that resemble running shoes. Whether you’re a traditional golfer or a trendy one, it doesn’t matter. There’s something for everyone. 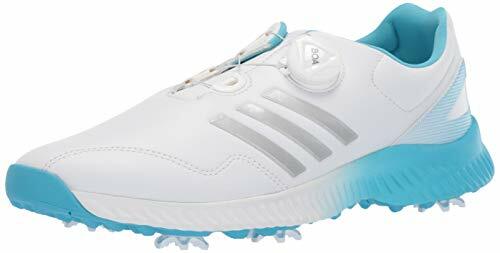 The Adidas Adizero Sport II women’s golf shoe has a fit that’s pretty decent. They come with a different style and cut. Comfort is their main selling point. The shoe’s uppers come with fabric and synthetic material thus making the shoe highly comfortable and lightweight. One of the most amazing attributes of this shoe is that its toe box is highly spacious for your needs. You can also look forward to its Climaproof protection meaning even if you wear the shoes for hours, your feet will stay fresh, cool, and dry. When it comes to their footbed, the shoe has a TPU layer which offers balance and stability every time you make lateral movements. The shoe’s outsole has a spikeless design to boost flexibility and grip. While this footwear boasts an array of impressive features, one area that it lacks has to do with its arch support. 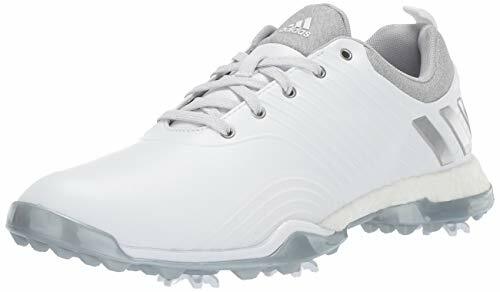 This golf shoe for women from Adidas is the best fit if you’re a golfer looking for an ultra-lightweight shoe with a firm grip. When placing your order, ensure you order one-half size up. Tee off in these comfortable, reliable and classy golf shoes. They feature a spikeless design that offers extra flexibility for your feet as they pivot during your swing. Made from quality materials, there’s no doubt that these shoes are not only stylish but also made to last. They have a midsole, which boasts 5GEN technology for an excellent blend of support, protection, and comfort. The shoes are ideal for playing in all weather conditions. They feature an impressive H2GO Shield and canvas oxford upper for water resistant protection. Without a doubt, these shoes are always ready to carry you right from the premier hole to the clubhouse. These shoes are highly recommended mainly because you can play on them in any weather. Whether it’s hot, humid, warm, or cold, the shoes’ material allows your feet to stay dry and cool. Ecco has been a key player in the shoes industry for more than fifty years now. The company’s shoes are renowned for being extremely durable and boasting fantastic quality. 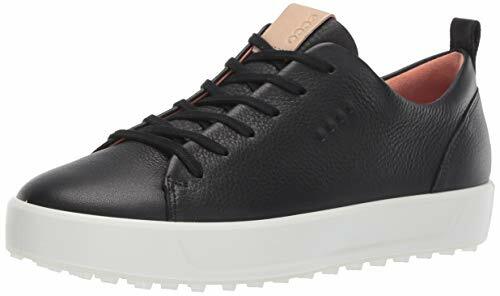 These women’s golf shoes from Ecco are no exception. The shoe features a top-notch outsole that brings with it three segments specially tailored for ‘multi-purpose zonal performance.’ One is for stability, the second one for rotational support, and the third one for durability. Another highlight of the shoe has to do with its professional performance and comfort features, which make it a pleasure to put on the golf course. The shoe’s hybrid technology maximizes traction and stability. Its soft yak upper perfectly encases the foot in supple leather. The Ecco Women’s Biom Hybrid Golf Shoe is the best shoe if you’re a golfer that likes to feel closer to the ground while at the same time enjoying advanced support and superb cushioning. The ADIDAS ADIPOWER 4ORGED is water-repellent golf shoes that feature a wide fit for utmost comfort on the links. You longer have to worry about the harsh elements as you play. 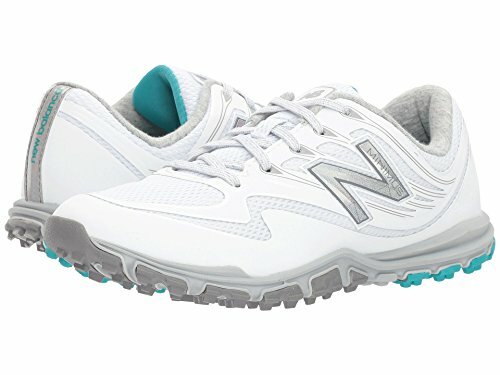 With their responsive cushioning, these shoes return energy all through your round. They bring with them a durable lightweight upper that provides lateral stability on each swing. The shoes have an enhanced outsole that offers you strategic traction and grip especially in wet conditions. Their Boost tech offers something that’s completely different to the other ones in the market. During a swing, you’re assured of feeling a natural bounce due to their excellent cushioning. In terms of performance, there’s no doubt that these are incredible. Expect to enjoy a spongy feel right on the heel especially when walking between holes and loading into a shot. In addition to being comfortable and warm, these shoes don’t allow any moisture to get onto your feet even when playing in the rain. Their spikes ensure there’s no loss of grip at all. Great for agile movement – Their bounce cushioning offers enhanced flexibility and comfort. 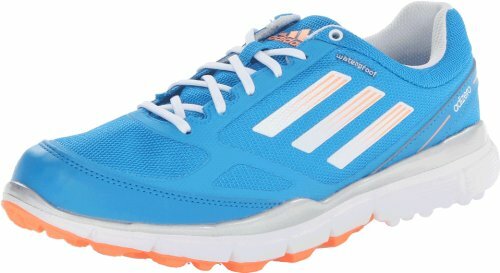 Energized cushioning – Courtesy of the shoe’s responsive cushioning, the more energy you offer, the more you get. Enhanced stability – The shoes bring with them a forged upper for stability, lateral support, and durability in golf-specific areas. Stay dry – Their climastorm offers water-repellant protection to ensure you remain comfortable and dry. While their spikes are great for firm grip, they seem to leave plenty of marks on soft greens. Overall, these shoes are without a doubt an amazing option especially if you’re looking for those with Boost technology, performance, and feel. Stylish and comfortable are the two words that perfectly describe these shoes. What’s more is that they offer an excellent grip both for walking and during your swing. While style is a personal preference, you can’t deny that these shoes are nice looking. On wet days, you don’t have to worry about the harsh weather elements as the shoes provide great waterproof protection. Of course, when buying a golf shoe, comfort is one of the things you must consider. A shoe’s design and material used to make it need to be made in such a way that when you wear them, you don’t have to grapple with blisters or pain. An amazing attribute about these shoes is that once you slide them on, they’re comfortable for the entire time you’ll be at the course and even beyond. Even in the heel area, the shoes are comfortable since the feature ample padding. Their leather uppers usually flex incredibly well. What about their grip? Occasional slips are common when playing golf. Therefore, you need a shoe that has a firm hold on the ground. When wearing these ones, the last thing you have to worry about is slipping. They don’t lose traction at all. During your swing, you can rest assured that your footwear is stuck to the ground. This feature is beneficial especially to golfers that normally have too much foot movement. If class and style is what you look for in a golf shoe, then these ones make an excellent choice. When it comes to the sport of golf, having the proper golf shoes is imperative. 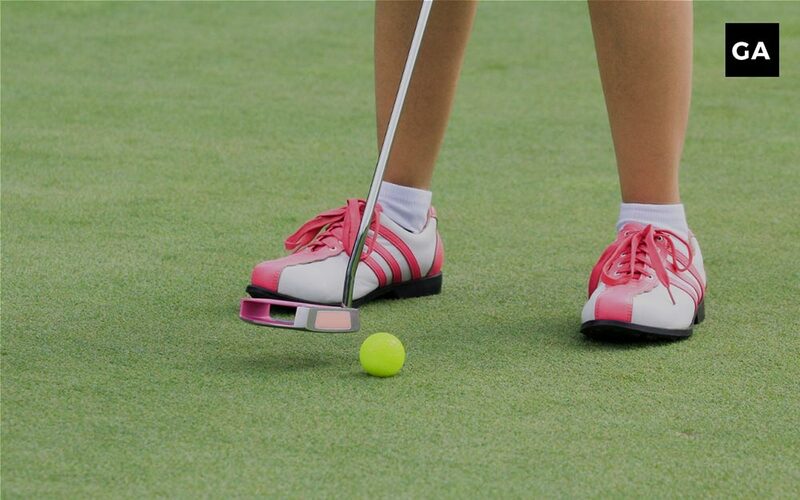 If you’re a woman golfer that suffers from discomfort, these shoes might be exactly what you need for your game. The last thing you want is to experience pain when playing your favorite sport – golf. These shoes are specially tailored for all-day comfort. Their arch support guarantees this comfort. The feature helps to relieve tension or arch pain. The other important arch aspect is massaging the foot-bed hence keeping you feeling fresh throughout the game. The shoes also bring with them ventilation holes that offer better air circulation meaning that you never feel any heat while on the course. You’ll also love the adjustable design that these shoes boast. With this attribute, you’re guaranteed that your footwear is of high quality. The fact that they’re fully adjustable means that they have an adjustable loop and hook strap for better fastening which allows for an effortless custom fit each time you use them. In terms of value and cost, the shoes certainly offer value for your money because of their long-lasting nature. In addition to being well built, the shoes’ construction is from top-notch materials. Their cost varies depending on the size, style, and color that you choose. These shoes are the ideal choice for those looking for functionality, durability, quality, and comfort. Stylish ballerina inspired climacool mesh upper construction with reinforcement zones for lightweight stability through the swingOn/off course fashion appeal ____________________________________ User Reviews:li"These are the most comfortable golf shoes ever! Size is true, it's like playing golf in your slippers^"
Adidas is without a doubt a household name when it comes to manufacturing shoes. The company boasts a record of accomplishment for many years. In terms of golf shoes, the brand doesn’t disappoint. This shoe is no exception. The most notable feature of this amazing shoe has to do with its ultra-light construction design. Made from synthetic and texture materials, the shoes will give you all the comfort you need when playing. 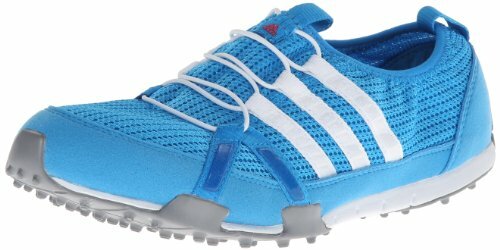 Adidas also put some thought into ensuring the shoe offers a lightweight stable balance when off or on the course. This shoe features reinforced areas which has further added to the durability. The shoe is more than comfortable. It’s a slip-on shoe with nonfunctional laces, which makes the opening smaller. Nevertheless, you can be assured that they’ll fit perfectly. The shoe’s sole have great spikes on them. The only downside is that they’re narrow on the sole. The other highlight that you’ll fall in love with has to do with their stabile nature. Do you have narrow feet? At first, the shoe’s appearance might make you think that they aren’t perfect for golfers with narrow feet, which isn’t the case. These shoes are specially tailored for the golf course. They’re great at getting you lower to the ground hence ensuring you enjoy a more natural feel and fit. The shoe’s REVLite midsole cushioning perfectly supports your feet. The shoes have a breathable mesh upper that has a fantom fit. They bring with them a spikeless rubber outsole to offer great traction and support on the swing. 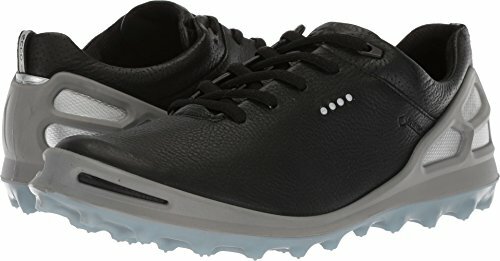 This is the best golf shoe for those looking for multipurpose footwear. You can use it when on the course and running on the field or treadmill. They’re also a great option if you have narrow feet. With these amazing shoes, emerging yourself in style is a walk in the park. The shoes have DuraMax™-rubber outsole that offers turf gripping durability and performance. The shoes are closely contoured to perfectly match your foot’s shape. To guarantee optimal comfort, the shoes bring with them PillowSof™-molded foam. They have lightweight cushioned fit beds, which offer heel support and underfoot comfort on every step of your game. Their spikeless design offers durability and traction on all terrains. The shoes boast impressive stability off and on the course. They are an excellent choice if you’re looking for a shoe with proven spikeless performance. There’s no better way to go flag hunting than with these shoes from Nike. With synthetic and waterproof leather upper, you can play in any kind of weather. That coupled with the fact that they’re highly comfortable, simply means that these shoes were simply meant for winners. With their synthetic leather upper, the shoes guarantee utmost durability throughout your golf round. The shoe’s reinforced saddle-shaped overlay is inspired by classic oxford shoes meaning that these ones are beyond classy. Their fitsole sockliner adds plush cushioning directly to your underfoot. They have a hybrid outsole and removable spikes all-round the heel and lateral side for an optimal grip. These shoes are the best choice for those looking for a shoe that offers enhanced traction in any kind of terrain. ECCO women golf shoes are specially designed with attention to how both of your feet related to your swing. They’re incredibly constructed to offer luxurious comfort right from the moment you put them on. The company has partnered with BOA to offer you an innovative system, which assures you of custom comfort with no pressure points. 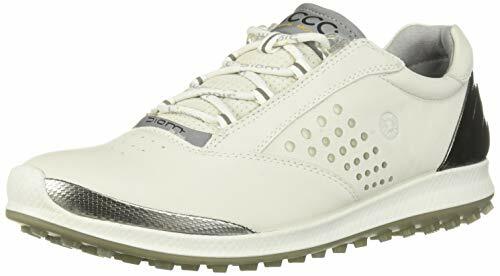 The ECCO Ladies Cage Pro Gore-Tex golf shoe for women is made from Lrya, which is a naturally tumbled leather that offers increased breathability properties as well as high performance. Its ECCO SPYGDR-Grip has naturally placed pivot points, which offer a strong foundation when you’re handling backswing. The shoes are accurate to the millimeter. Their all-new L6 reel platform makes use of a subtle dial, which boasts a lower stack height. You can also look forward to a smaller diameter for adjustment and effective closure compared to the conventional laces. 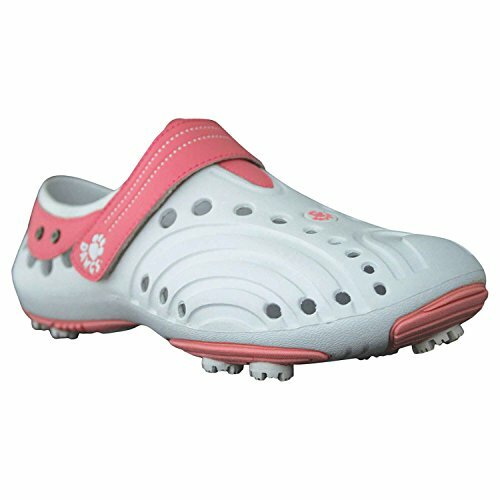 This golf shoe for women offers a casual and comfortable look for the course. It’s specially built for a customizable fit. A notable feature of the shoe is the fact that it has a bounce midsole for purposes of flexible cushioning with each swing. The shoe’s water-repellent climastorm provides effective breathable protection even in wet weather. Their bounce cushioning ensures stability and comfort as you make your swings. Their Adiwear outsole provides extra grip as well as durability in soggy conditions. They have a power-transferring bounce midsole that improves swing stability and walking comfort. With their lightweight, microfiber, synthetic leather upper, you’re assured of effortless cleaning, incredible performance, and utmost comfort. They boast a wide forefoot for overall comfort, improved fit, and feel. The six-spike thin tech outsole guarantees long-lasting abrasion resistance as well as traction. Finally yet importantly, they feature a low-profile Thintech EXP cleat for green friendliness, durability, traction, and stability. If you’re looking for shoes that you can shoot the fairway in any kind of weather, then these ones are the best. These shoes from ECCO have a highly durable and aircraft-grade stainless steel shoelaces, which are able to put up with the highest tension. With just one of your hands, you can effortlessly and precisely adjust the laces. The laces and dial of each BOA closure system are tailored for long-term durability thus guaranteeing greater individual fit, comfort, and functionality. The construction of the shoes is from a highly durable and water resistant TPU material that comprises of roughly 100 molded traction bars which makes the footwear not only flexible, but also shock absorbing. 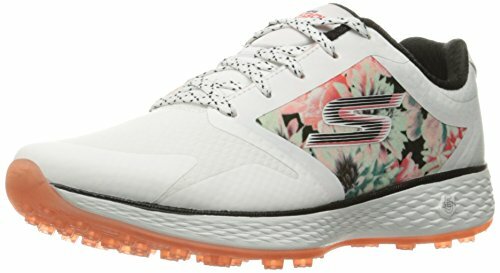 This is the best shoe if you’re looking for golf footwear with a low profile to bring you closer to the ground hence guaranteeing you more stability, swing power, and traction. Runs true to size - If in between sizes go to the lower size. The company is renowned for creating high quality loafers and moccasins. Their manufacturing of golf shoes doesn’t disappoint either. 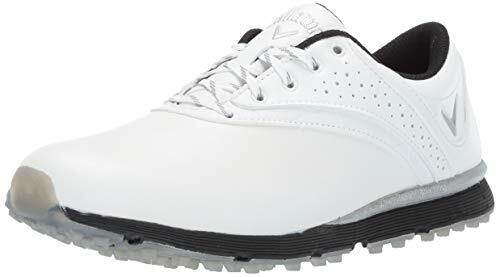 The Marc Joseph NY Women’s Golf Shoes are impressive in terms of performance, quality, comfort, and price. The shoe brings with it an exclusively designed soft rubber sole for excellent traction while on the golf course. The sole also ensures that it’s lightweight and highly comfortable. These are an amazing option if you’re into simple, low-profile golf shoes. In the recent past, golf shoe materials have enormously developed. Different man-made products are now used in both the outsole and upper sole to offer a combination of waterproofing, stability, and comfort. Leather – This is the most common. It creates a tight-fitting and stretch-free waterproof shoe. Leather is an excellent option for summer golf. Its main drawback is price. Waterproof linings – Goretex is the top material if you’re looking for a top-notch waterproof shoe. In addition to being water resistant, it’s also thick. Finally yet importantly, the material is fully waterproof and breathable. Synthetic – This is the cheapest alternative the above two. It’s basically nonporous polyester that evenly spreads over the shoe in order to protect the shoe’s outer shell. Durability and quality are among the most important features to consider when shopping for a golf shoe. Just like with any other purchase, you must ensure the shoes you buy have the right material to guarantee their quality and durability. If you play golf often, then you’ll need a high quality pair of shoes. For those that play two or three times in a year, spending too much on a shoe is unnecessary. The obvious thing to do is to buy the correct size. Check on the sizing guide for every manufacturer’s product page for a guide on the sizing. Conventional shoe laces are still very common. However, other alternatives are now available. The modern and proprietary lacing system aids the effortless removal and securing of a shoe. Uncomfortable golf shoes will definitely harm the performance of your game. Consequently, when your order arrives, try them on and if you’re uncomfortable, return them to get comfortable ones. Some golf shoes are heavier compared to others. Before making a purchase, check on the shoes’ weight to avoid buying a too heavy or too light a shoe for your golf needs. Manufacturers of golf shoes engineer them to prevent your feet from sliding when swinging your club. You should settle for a good fitting and high quality pair of shoes. Golf shoes have wide rubber soles that increase their sturdiness. Coupled with sharp tongs, this feature prevents your shoes from slipping which might occur on the grass. Most shoes also offer solid and stable arch support. Shoes for playing golf, particularly those made from materials such as Gore-Tex allows feet to remain moisture free and breathe hence prevent sweating. Others feature a footbed that consists of polyurethane and charcoal both of which are great at warming or cooling your feet depending on circumstances. Golf shoes have extra padding to not only support the midfoot but also offer shock absorption to your foot. Midfoot support is significant especially when you’re driving the ball. The classic golf shoes feature tassels and leather along with white and black wingtips. They are an ideal option for those who are into old school golf shoes. Together with their retro style look, spiked shoes also boast of comfort, breathability, and traction and water resistance. When in the market for spiked shoes, it’s essential to choose a pair based on both your needs and personal tastes. A major positive attribute about spiked shoes is the fact that they effortlessly bring your swing together because they’re more stable compared to other types of shoes. Golf sandals are preferable to golfers who are in hot climates. They feature a timeless design. In addition to being breathable, the shoes are perfect to put on during hot summer days. A notable attribute about these shoes is the fact that they’re fairly affordable. The main downside is that you can’t wear these shoes if you intend to walk long distances because they might give you a blister. If you’ll have access to golf buggy, they’re the best shoe to wear. The other drawback to these shoes is that they offer less support to your feet. Moreover, they have limited resistance when it comes to wet weather. However, provided you can handle all these drawbacks, they remain an excellent choice for golfers in hot climates. Golf boots are considered a rarer version of golf shoes. The look of a golf boot is more like those that people wear when going for a mountain hike. If you’re looking for a waterproof alternative to the regular golf shoe, these ones are the best. Golf boots usually offer great warmth and traction particularly during the winter months. The only issue is that they might be heavy for some users. What’s more is that they do not allow as much freedom around angles during a swing. Some golf boot models have gaiters to offer increased water protection. These ones tend to be more expensive since their outer material is thick. The good thing is that they work incredibly to keep water and mud out. In the recent past, there has been a tremendous rise in the creation of spikeless shoes. The sneaker styles have turned out to be highly popular in clubhouses and tee boxes. Often, they come in the form of a comfortable and lightweight shoe, which can transition, effortlessly on the golf course. A good number of expert golfers put on these street-style shoes, for both comfort and their ability to aid with foot and back pain. Just like with the other types of shoes, these ones also have their downsides. For starters, they are less stable. Additionally, they have less grip. In most instances, they lack waterproofing. Molded soles offer fewer grips especially in wet and longer grass. With a huge variety of golf shoes available today, figuring out which one is the best can turn out to be a daunting task. It’s more challenging if you’re new to the game. It’s vital that your feet are always comfortable when you’re golfing especially bearing in mind that on average you walk 4 – 5 miles on an 18-hole round. Whether you need a new pair or are new to golfing, landing the best women’s golf shoes is paramount. In addition to making sure your shoes fit properly, you also need to make sure that you stick to your budget. From the many shoes available in the market today, the above are the top 14 best shoes for women golfers. 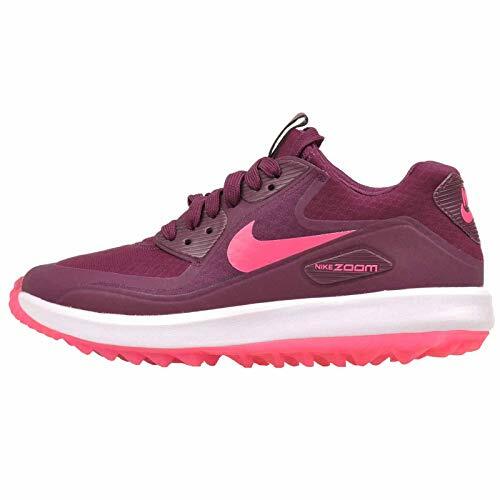 Choosing the best womens golf shoes is easy with our detailed reviews!